Goddess Garden natural sunscreens for children are available in formulas for baby and older kid’s. When it comes to sunscreens, you want the best possible UVA and UVB protection that is safe, yet effective for the entire family without all the chemicals, especially where your sensitive little ones are concerned for their best health. Let me tell you about Goddess Garden natural sunscreens for children with certified organic ingredients that I was sent for this review that can help keep their delicate skin and developing bodies safe. 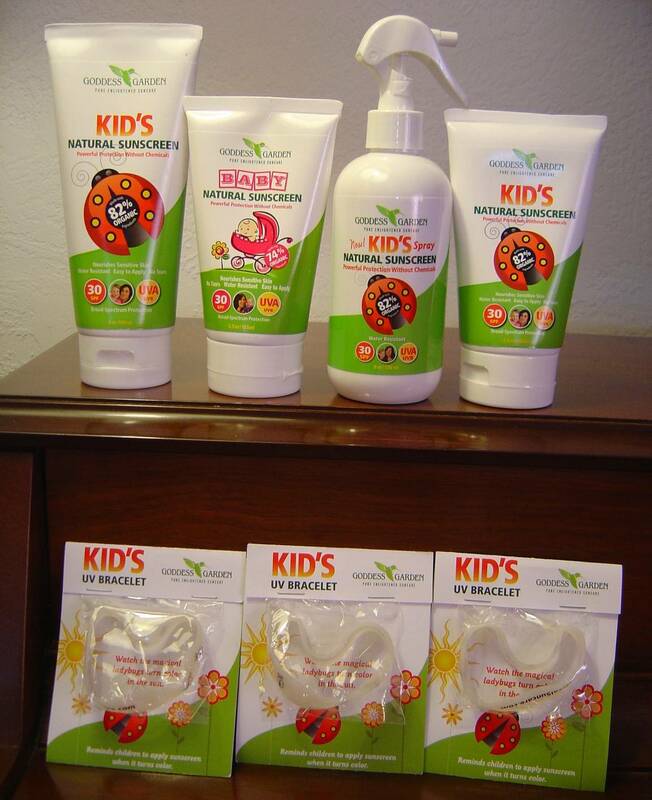 I received a variety of chemical-free Goddess Garden natural sunscreens for kids and babies with SPF sun protection of 30 and some UV Bracelets for Kids. What is exceptional about these sunscreens is that they use the highest certified organic content available in their sheer mineral-based products and work upon application unlike chemical sunscreens that take about 20 minutes to kick in. Both items received high ratings by EWG in 2011 for superior broad spectrum protection effectiveness while being non-toxic. Their Baby Natural Sunscreen is scent-free for delicate little noses and uses certified organic pure zinc oxide, vitamins, and antioxidants as it tenderly kept up to 97% of UVA and UVB rays away. Our family loved how these non-greasy and water-resistant sunscreens worked. At the same time, I gained peace of mind knowing I wasn’t polluting their susceptible young skin with tons of those typical sunscreen chemicals while also helping preserve the environment with their biodegradable formulas. We loved the convenience of the Kids Natural Spray especially for re-application for all of us. You can buy Goddess Garden natural sunscreens for children as well as their other nontoxic products online or locate a store near you! Next Post Are You Taking Your Dietary Supplements Properly?